Public support for extending British airstrikes against Islamic State (IS, formerly ISIS/ISIL) from Iraq into Syria has plummeted since MPs voted in favor of broadening the scope of intervention last Wednesday. A YouGov opinion poll conducted the day after Parliament approved airstrikes, December 3, found that just 44 percent of Britons approve of the action – a dramatic drop from the 60 percent who backed the measures on November 24. Support for intervention remained consistent at around 58 to 60 percent between mid-September and November 24. Following a highly publicized debate on airstrikes, during which the case for war came under scrutiny from Labour, the Scottish National Party (SNP) and rebel Tories, public mood appears to have shifted. Cameron’s case for war rested on the existence of 70,000 moderate ground forces in Syria, a number which was dismissed as “magical” by Julian Lewes, the Conservative chair of the Commons Defence Select Committee. 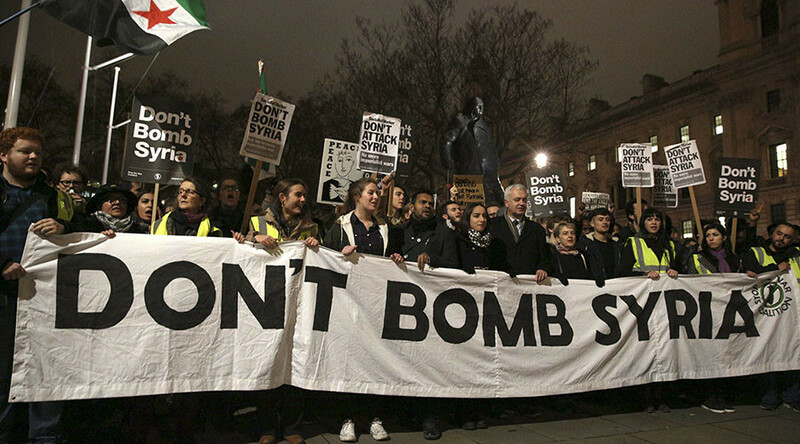 Support for airstrikes among Labour members dropped even further to just 29 percent the day after the Commons vote. More than half of Labour supporters were in favor of military intervention when asked the same question in earlier in November. Some 51 percent of Labour voters now “disapprove” of airstrikes, compared to the 25 percent who were against military intervention in November. Labour leader Jeremy Corbyn was staunchly opposed to extending airstrikes into Syria and faced rebellious pro-war voices within his shadow cabinet and party ranks. Deputy Leader Tom Watson and Shadow Foreign Secretary Hilary Benn both voted for the war after Corbyn gave Labour MPs a free vote on the matter. Some 66 Labour MPs defied Corbyn and voted for the motion, while 153 voted against. Corbyn argued that the PM had not made a convincing case for airstrikes and warned they would result in civilian deaths. Cameron was criticized throughout the debate after it emerged he called Corbyn and shadow chancellor John McDonnell “terrorist sympathizers” because of their opposition to airstrikes. Twitter users sent the hashtag #terroristsympathiser trending on Wednesday morning – with many who propelled it up in the rankings having used the tag ironically.